Stony Clove-Warner Creek stream restora­tion project imme­di­ately after construction. The Stony Clove Creek-Warner Creek Con­flu­ence stream restora­tion project was con­structed in 2014 in the ham­let of Chich­ester, NY to address ero­sion and stream sta­bil­ity con­cerns. The project site is located at the con­flu­ence of Stony Clove Creek and Warner Creek and extends down­stream end­ing before the Sil­ver Hol­low Rd. bridge. This reach of of the stream is extremely steep — the slope is about 4%, and the chan­nel is con­fined within the stream­banks dur­ing high flow events. Over the years, fast flows had cut through the stream chan­nel bot­tom, caus­ing the stream banks to slump. Large cracks appeared in the banks, indi­cat­ing the poten­tial for mass fail­ure. If left unchecked, bank ero­sion would threaten both Route 214 and Sil­ver Hol­low Rd. Accord­ing to the Stony Clove Creek Stream Man­age­ment Plan, the project site was the his­toric loca­tion a rail­road tres­tle for the Stony Clove and Kaater­skill rail line that began oper­a­tions in 1883. Prior to this, the Warner Creek and Stony Clove val­leys had been logged. Both activ­i­ties prob­a­bly impacted the project site sig­nif­i­cantly. While the loca­tion of the stream chan­nel remained fairly sta­ble over time, the bed itself steadily eroded down­ward caus­ing the adja­cent banks to destabilize. Between 1980 and 2000, rip-rap revet­ment (a lin­ing of large rock) was placed on the stream’s right bank, which dur­ing the 1996 floods appeared to trig­ger severe ero­sion on the left stream bank where ero­sive flows were now con­cen­trated. After­ward, the left bank was also rip-rapped. The Town, NYSDOT, and nearby landown­ers installed and repaired the rip-rap walls over the years. Still, about 1,366 feet of stream­bank was actively erod­ing by 2001 when the AWSMP con­ducted a stream fea­ture inven­tory. At that time, 1,103 feet of banks were lined with rock revet­ment. Floods in 2010 fur­ther desta­bi­lized the stream bed and banks. Recent removal of an old abut­ment may have added to insta­bil­ity of the bed at the Stony Clove’s con­flu­ence with Warner Creek. 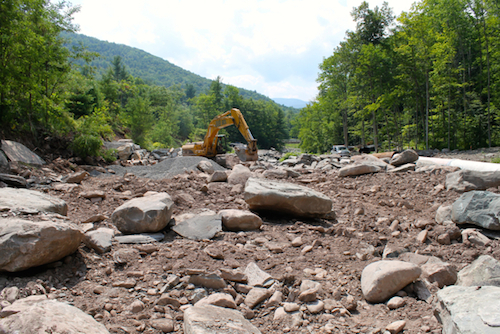 Stony Clove — Warner Creek Stream Restora­tion Project dur­ing con­struc­tion, August 2014. 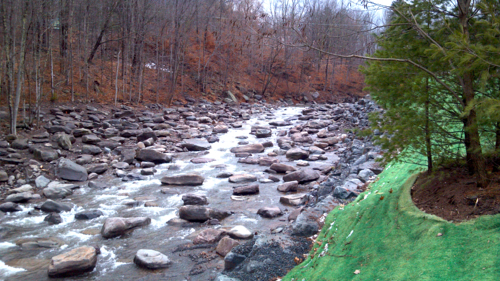 The Stony Clove Creek Stream Man­age­ment Plan rec­om­mended full restora­tion of the site. Rec­om­men­da­tions included instal­la­tion of a series of large rock step and pool struc­tures to con­trol the stream’s grade and direct ero­sive forces away from the banks. Another rec­om­men­da­tion was to install a flood­plain bench between the active chan­nel and erod­ing banks, and then sta­bi­lize the bench with tree and shrub plantings. The con­struc­tion firm Baker Broth­ers Exca­vat­ing of West Hur­ley, NY was hired to install the series of large rock struc­tures to pre­vent chan­nel ero­sion. The struc­tures look like rock “steps” found in steep streams through­out the Catskills. The engi­neer­ing firm Milone & MacB­room, Inc (MMI) designed the project. MMI and the Ulster County Soil and Water Con­ser­va­tion Dis­trict pro­vided con­struc­tion oversight. To fur­ther sta­bi­lize the chan­nel bed and pre­vent its ero­sion, thick metal sheet-piling was dri­ven 10–23 feet into the ground with one of the largest excavator-mounted pneu­matic ham­mers avail­able. The pil­ing was buried under native boul­ders and fill that restored the bed to a sta­ble ele­va­tion. With the stream bed restored to a sta­ble ele­va­tion, flows now access a small flood­plain along the bank. The rock steps in the chan­nel and flood­plain absorb the energy of fast flows. At project end, the stream banks and flood­plain were re-vegetated with native trees and shrubs to hold any exposed soil and pro­vide cover for migrat­ing fish. Although this steep sec­tion of the Stony Clove is believed to pro­vide lim­ited habi­tat for fish, the con­struc­tion crews observed large trout at the site.